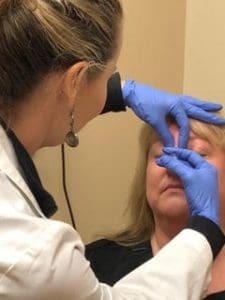 Botox® Cosmetic (onabotulinumtoxinA) is an injectable product used to temporarily improve the appearance of fine lines and wrinkles that appear due to muscle activity. Botox is a great way to soften movement lines of the face without taking any downtime. It typically takes 3-7, but up to 14 days, to take effect. When used appropriately, Botox can last 3-6 months. Botulinum toxins are not interchangeable and efficacy is based on placement and amount of units used. At The ENT Institute, our injectors are well-trained in facial anatomy and pride themselves on perfection. They offer comprehensive consultation with evaluation of the facial structures, muscle movement, and severity of wrinkles at baseline. During consultation, they recommend appropriate treatment as well as suggest alternatives should there be other cosmetic concerns.